For the last month or so we’ve all no doubt become familiar with the spectacular images of the ‘militarized’ policing of the Ferguson, MO uprisings following the murder of Mike Brown. We’ve seen the voluminous streams of tear gas cascading down upon protestors, the roving Armored Personnel Carriers (APCs) carrying platoons of Battle Dress Uniform (BDU) clad officers, and the furtively stationed sniper posts dotting the diminutive strip-mall rooftops of West Florissant. To this point much as been said about ‘police militarization’ and the effect this brute show of force had on the now-subsiding protests. Others have also documented and analyzed the more ‘soft’ forms of counterinsurgency currently being deployed to quell the unrest, of which the clergy and other faith-based organizations, for example, have played crucial roles. This article, however, seeks to intervene in this conversation by examining some of the less spectacular aspects of the repression efforts and to briefly discuss how these techniques contributed to the demobilization of more radical forms of protest. The policing and containment of the Ferguson uprisings was largely effective through the deployment of a complex strategy of spatial control — one that effectively redrew the geographical boundaries of the city and neutralized the considerable advantages initially held by militant protestors in the conflict’s earlier stages. This article will briefly document and analyze the various methods and techniques through which the St. Louis Metropolitan Police, the National Guard, and several other local law enforcement formations were able to gradually achieve a kind of ‘total spatial dominance’ over this small region and its residents. As Steven Herbert notes in his book Policing Space: Territoriality and the Los Angeles Police Department, “successful marking of space is a foundation of successful policing.” There are myriad and often mundane ways that police officers achieve or wrest spatial dominance in a particular circumstance, such as the use of checkpoints or the deployment of various surveillance systems. But the policing of space does not solely occur through the exercise of force or presence by police officers themselves, but may also be conducted through the manipulation of architecture, the control of movement through the pathways of a given territory, and/or the situational redrawing of borders. Furthermore, the policing of space is not something which is conducted along one horizontal axis or plane. Through the strategic seizure or occupation of three-dimensional space, by utilizing airpower for example, policing power ensures an omnipresent and extended vision over a contested zone to reinforce ground operations while allowing for the proliferation of highly-visible symbols of police power to act as a deterrent effect on those caught beneath or within its gaze. All these elements of spatial policing were used in differing degrees to de-escalate the uprisings in Ferguson. These techniques, of course, would have been indispensible without a vigorous coalition-led counterinsurgency campaign to seize political legitimacy from the rebellious forces of Ferguson. However, as we saw several days into the rioting, it was precisely the ‘unruly geography’ created and utilized by the residents that made the former a more difficult prospect – thus, the spatial policing efforts in this case must not be neglected. Counterinsurgency operations, as they are most frequently carried out in various theatres of conflict, rely upon the strict management of a territorial region in order to allow coalition forces to establish a certain closeness or familiarity with the native population. Without a clearly-defined territorial strategy and the inability to secure a kind of proximity such operations will very likely be unsuccessful. This article will offer a truncated analysis of these spatial techniques, based upon both prior news coverage and analysis as well as first-hand observational notes collected several days after the deployment of the Missouri National Guard. The following section offers a brief glimpse into a number of spatial policing techniques utilized by the law enforcement coalitions on the ground in Ferguson. Most photographs were taken by the article’s author, but some have been taken from other sources to provide greater clarity. Just south of the main conflict zone, near the corner of West Florissant Avenue and Lucas-Hunt Road, lay the main command center for local law enforcement divisions and the Missouri National Guard, as well as the primary media staging area. This command center was established in the heart of a major strip mall, containing stores such as Target, Schnuck’s, and other smaller retail outlets. Behind the Target building was another, less visible, site that housed the Department of Corrections, Child Protective Services, and other local or state government agencies. The strategic importance of securing this zone was readily apparent. The location of this strip mall was situated at the highest point overlooking West Florissant Avenue and the adjacent residential housing blocks, providing rapid access into the flatlands in addition to advantageous surveillance positioning. Furthermore, its proximity to the West Florissant Avenue and Lucas-Hunt intersection allowed for the establishment of checkpoints and blockages of foot or vehicle traffic from nearby neighborhoods. This article will deal with checkpoints in more depth later, but it can’t be emphasized enough how crucial the process of redrawing and enforcing borders was to the containment of the uprisings. As many news outlets have documented, youth from nearby housing blocks or cities had flocked to West Florissant Avenue to demonstrate on an almost nightly basis. The redrawing of these acted both to disallow the intervention of ‘outside agitators’ and to contain the unruly elements located within the mobile barriers. Finally, the command center sat directly across from one of the main facilities for Emerson Electric, a St. Louis-based and Fortune 500 Company specializing in automation and climate technologies and certainly one of the largest corporate entities in the area. Protection of these facilities was no doubt a high-priority for local law enforcement officials, and the company itself had employed armed, plain-clothed security officers and placed concrete barriers at its fences to prevent intrusion by protestors. 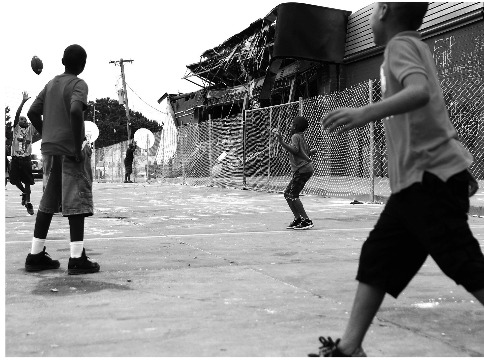 The enactment of a ‘No-Fly Zone’ over Ferguson during the peak of the riots is well-known by this point. This maneuver, in addition to the nightly deployment of police helicopters, served to disallow aerial media coverage from documenting any potential acts of aggression or violence toward protestors, and also allow an unencumbered view from above of a relatively cramped, complex maze of neighborhood streets that residents often used as a means of escape or camouflage for the shooting of police vehicles. On a somewhat parenthetical note, one of the more interesting aspects concerning the (aerial) policing of Ferguson is the routine flyovers conducted by the Missouri Air National Guard who are stationed just outside of the St. Louis International Airport. These flight routines are conducted on a semi-regular basis throughout the day, and reveal one of the less visible and more mundane characteristics of ‘militarization’ that permeates the everyday life of the region’s residents. One of the central methods of achieving spatial dominance was the use of strategically located checkpoints and traffic reroutes along various high-traffic nodes and, most importantly, the Canfield neighborhood where Mike Brown was shot. This approach of using multi-layered checkpoints effectively redrew the borders of Ferguson, limited the mobility of residents and ‘outsiders’ and allowed for the tighter containment of militant youth in the residential areas. The former, the checkpoints located at major, high-traffic nodes that facilitated movement in and out of the main conflict zone on West Florissant Avenue, were operational beginning around 6pm on an almost nightly basis. At the corners of Chambers Road and West Florissant Avenue, Lucas-Hunt Road and West Florissant Avenue, and Ferguson Avenue and West Florissant Avenue, St. Louis Metropolitan Police and Missouri Highway Patrol officers established stoppage points that would reroute foot and vehicle traffic and, in some cases, conduct field searches of persons or vehicles they deemed suspicious. It is perhaps no surprise that the majority of the stops and searches issued were to Black males. As conflict de-escalated over several days, more searches would be conducted on individuals deemed ‘outside agitators,’ leading to several arrests. The neighborhood checkpoint located at Canfield Drive and West Florissant Avenue functioned mainly as a stoppage point for foot or vehicle traffic flowing out from the residential area near the site of Mike Brown’s murder. Pedestrians and vehicles were routinely stopped and sometimes searched in the late evening hours. In a procedure reminiscent of the residential checkpoints of mid-80s Los Angeles, individuals who could not verify their residency in this area were not permitted access to Canfield Road and, in some cases, those who did reside in these housing blocks who had forgotten their I.D.’s were turned away and forced to find shelter elsewhere. In addition to these major intersection and neighborhood checkpoints, manned police vehicles were staged at the entrance to every neighborhood street emptying out onto West Florissant Avenue, though vehicle or pedestrian searches were not being enacted at these points and appeared to be used predominantly for surveillance purposes. The main conflict zone of West Florissant Avenue has a unique, yet familiar layering of architecture that reflects some of the major historical economic and spatial rearrangements that have characterized the past half-century in the St. Louis metropolitan area. This history is too large to explore in these brief notes, but it is worth mentioning that the main conflict zone, itself a noticeably older section of the city, lacks much of the ‘security’ architecture and technology that many of us who reside in major urban regions live under or within on a daily basis. Security cameras and even barbed wire are difficult to locate in most places. That is, until you reach the more newly developed region near the location of the command center at the south end of West Florissant Avenue, where surveillance equipment especially is much more noticeable and the surrounding architecture takes on a kind of ‘fortress’ character. It is likely, however, that these devices or architectural configurations will eventually proliferate more widely in the post-riot efforts to secure the city against future uprisings. Other noticeable ‘weaponized’ architectural installments include the use of large concrete barriers or blocks to prevent the circulation of vehicle traffic near major gas stations and other businesses but also deep in the Canfield neighborhoods. Since 9/11, these large concrete barriers or blocks have been used with greater frequency in major U.S. urban cities to prevent the use of vehicles as explosive devices to destroy large buildings or military installations, a military architectural strategy used in active battle spaces from the West Bank to Baghdad. As has been documented sufficiently elsewhere, one of the central anti-riot procedures adopted by law enforcement officials was to prevent the use of West Florissant Avenue streets for protest. This included the directive against standing still or ‘crowding up’ and the establishment of an ‘approved assembly area’ which was, of course, situated quite close to the command center on the south end of the road. Even when curfew laws were relaxed and the demobilization efforts appeared to be victorious, the recuperative forces of the NAACP, the clergy, and other related groups reinforced these directives all day and night. On occasion, young Black youth from the Canfield neighborhoods would stage car shows in the middle of the street and slow traffic down while honking their horns and holding their hands high in the air. Perhaps in a show of defiance, but more likely as a result of the tremendous successes in securing the entirety of West Florissant against militant activities, the ‘approved assembly area’ established in earlier stages of conflict was almost entirely abandoned, save for a few folks who had set up tents and cooked food throughout the afternoon. If an officer stationed within a contested territory is unable to assert their dominance over the streets they are patrolling they have, to quote Jonathan Rubenstein, “surrendered [their] reason for being what [they] are.” For nearly a week, in spite of the massive show of force and brutality in the streets, the residents of Ferguson refused to give up their right to the city to the invading police forces. In order to reassert a visible showing of competency and territorial authority, Captain Ron Johnson and other high-ranking local law enforcement officials would engage in nightly ‘meet-and-greets’ along the sidewalks of West Florissant. After the evening checkpoints had been established throughout the neighborhoods and at the ends of West Florissant Captain Johnson, flanked by a swarm of reporters and minor security detail, would walk the perimeter of the emptied streets while shaking hands and posing for pictures with people gathered on the sidewalks. The role of clergy members and local church-affiliated groups in the repression of the Ferguson uprisings is extremely significant, though complicated. Whatever their intentions in the latter stages of the protests, however, it was clear that their visible presence along West Florissant was vital in the marking of this area as a ‘moral’ place for ‘good’ protestors. From the early morning hours into the evenings, church or faith-based groups erected tents, tables, and food trucks along the main thoroughfare that specifically targeted younger populations. These were, it appeared, the only instances of ‘crowding’ permitted along West Florissant. Within the context of the overlapping, intertwining modes of ongoing spatial policing, the presence of these faith-based organizations legitimized the police power at work on the street and provided their efforts with a kind of moral justification. Arguably one of the most significant victories won by the Missouri law enforcement coalition was the seizure of the now-iconic QuikTrip building on the corner of West Florissant Avenue and Canfield Road. Once a major rallying site and political center during the apex of the uprisings, it was soon fenced off, blockaded and entirely flanked in the evening hours by SWAT divisions and Armored Personnel Carriers. Much as the destruction of the Occupy camps several years ago was necessary to destabilize internal organization and destroy symbolic referents to the demonstrator’s social power, so too was the capture of the QuikTrip crucial in realizing similar objectives and controlling the movement of people and vehicles through the main conflict zone. Without the QuikTrip, and without the ability to centrally congregate, police forces were at least partially able to destabilize social forces and dictate the momentum of events on the ground. Walking around West Florissant Avenue and its adjoining neighborhoods, however, there are numerous visible markers of rebellion, and it is clear that struggles over the meaning and use of space are ongoing. West Florissant remains a highly active, open forum for political debate. Large fragments of concrete have been hammered away from sidewalks, building walls, and sewer drains. A large mural made from black butcher paper envelopes three sides of an abandoned commercial building with a prompt reading: ‘Before I die, I want to …’ Chunks of chalk sat in affixed plastic bags for passersby to join in the conversation. The site of Mike Brown’s killing, which stretches far down the middle of Canfield Road, is adorned with a large and continually growing memorial, strewn with flowers, notes, baseball caps, stuffed animals, and all other sorts of ephemera that residents and visitors have left to pay tribute to his memory. It is by far the most active social space in Ferguson, where countless people congregate to debate politics, trade stories, or discuss the future. It is unclear what will happen to this makeshift altar or how long it will be before law enforcement officials disallow its existence. As we have seen in recent weeks, it remains a touchstone for far many more than just the residents of the Canfield apartments who wish to keep the August rebellions alive. To reiterate, this article has sought only to intervene in and contribute to the ongoing analysis of counterinsurgency operations in the wake of the Ferguson uprisings, and does not wish to place greater emphasis on the importance of spatial strategies of containment than, say, the political campaigns of legitimacy waged by the clergy, local politicians, and others. It is this author’s hope that this analysis has contributed to a better understanding of a more neglected aspect of policing power and the role such techniques played in suppressing the Ferguson uprisings. Finally, it should be emphasized here that while the coalition forces in Ferguson did find a measure of success through the control of movement and territory, these are tense processes and are by no means closed to contestation. The attempted freeway shutdowns and ongoing protests of the past few weeks are particularly indicative of this fact and it is clear that, in spite of their best efforts, the policing powers of Missouri and the Department of Jusice may have been unable to stop the contagious spread of rebellion from the flatlands of West Florissant. ...the policing of space does not solely occur through the exercise of force or presence by police officers themselves, but may also be conducted through the manipulation of architecture, the control of movement through the pathways of a given territory, and/or the situational redrawing of borders.